Well, it's time for another review and giveaway from The Stratford Apothecary! I have come to really love this company...the products that they offer are so high-quality and luxurious. So, sit back and think a minute. Do you love to have company over to your home? I do! One thing I love to do is put out some special soap in my bathroom. It looks so nice to have a fresh bar of soap and sometimes, a freshly unwrapped bar of soap helps the bathroom smell so great too. (Always a plus!!) Special touches can also make your guests feel especially welcome and at home. The Stratford Apothecary™ have been in the business of providing people with the best products since 2004. Our focus on quality & uniqueness at an affordable price, make us comfortable in bringing you a line of personal & home products from Asquith & Somerset™ of England, & Castelbel of Porto, Portugal; formulated for those who demand quality, have an intrepid sense of adventure, & an eye for value. All products from our line are formulated to meet or exceed the demanding specifications of the finest world spas. You can trust the quality of the products from The Stratford Apothecary™. We use the finest ingredients in our complete line; essence of clove, lavender, olive oil, shea & cocoa butter, and coconut cream, among other essences impart aroma & texture to soothe every sense. You will see & feel the benefits of anti-oxidant vitamins, minerals, proteins & other natural ingredients in our products. With Portugal listed as a country from which some of The Stratford Apothecary's products originate, you cannot help but envision a luxurious product. Today, I am going to share a Portuguese "Destination" themed product with you and you are going to love it! 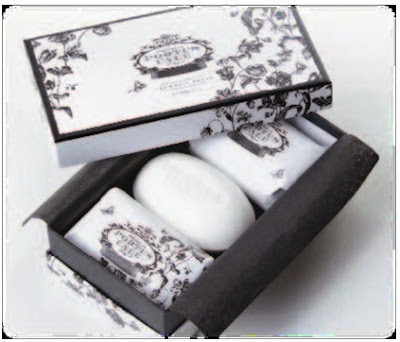 The Castelbel Portus Cale Gift Set is a set of three full-sized soaps, beautifully packaged and prepared for special occasions. The set which I chose is scented like Pink Lilies and White Tea. The box alone is gorgeous and would be perfect as a decorative box or gift box when you are finished with the soaps. My sister stopped by today and when she saw the box sitting on my kitchen table she gasped "That is an AWESOME box!! I WANT IT!" Ha ha! So, it is a very pretty box. Upon opening my package, I was immediately greeted by the most lovely fragrance. Oh, how pretty these soaps smell! I have never smelled white tea before but I have smelled lilies and yes, this combination of scents is lovely together. The soaps are all individually wrapped and look very elegant. I would not mind putting them, wrapped, into a basket for my bathroom decor'. I really was amazed at the carefulness of how each bar was packaged...it took me quite a while to get a bar of soap out. These Portus Cale soaps really made my skin feel soft and smooth...not to mention how clean and pretty they smelled too! I think that this gift set would make a lovely house-warming gift, or maybe just a nice gift to say "thank you" to a hostess. I also recommend having a few bars of this soap on hand for company and house guests...you would truly be a popular hostess!!! By the way, when you make a purchase on The Stratford Apothecary you can post a review of your product after purchasing. If you are the first to review that particular product, you will receive a $25 Gift Card to The Stratford Apothecary! Awesome!! So, in my opinion...the Castelbel Portus Cale Gift Set in the Pink Lily and White Tea scent is pretty amazing. The Stratford Apothecary knows how to cater to each and every need there is...including the hostess' needs. I loved this soap set and cannot wait to "wow" my next batch of company that visits my home! Lovely product! The Stratford Apothecary has offered to give away a similar set of soaps to one of you! The winner will have their choice of these scents: Floral Vine Plum Flower, Rose, Black Fig and Pomegranate or Island Flora. Have fun with this one and thanks for entering!!! Visit The Stratford Apothecary, then come back here and leave a comment letting me know which of their products interest you most. :) You do not have to be a blogger to enter, but you must have a valid email where you can be reached should you win. If you do not leave an email address, it must be where I can easily find it. This giveaway is open to US residents and will end 8/7 at 11:59 pm EST. The winner will be chosen using random.org and will be notified by email. The winner will have 48 hours to respond, or another winner will be selected. 1. "Like" The Stratford Apothecary on Facebook. 2 entries, so 2 comments. 2. Become a GFC follower of My Opinion. Leave a comment to let me know that you did/ do. 3 entries, so 3 comments. 3. Blog about this giveaway and leave me a link to your post. 5 entries, so 5 comments! Disclaimer: I received no monetary compensation for this post. I did receive a Portus Cale Soap Gift Set for review purposes. All quotes and stock photos are from the The Stratford Apothecary website and email. All thoughts and opinions are 100% mine. The Castelbel Drawer Liners Rose Scented interests me the most for my sleepwear items. The Castelbel Bath & Body Soaps in several scents interest me - rose, magnolia, orange, stargazer lily. Beautiful scented soaps is one of my ways to pamper me sometimes. I love the Fruits and Flowers Massage Soap In Tin - Cherry Blossom with sugar exfoliant! Thank you for the giveaway! I like the Castelbel candle - fig and pear candles. I like the Tropical Fruit Caddy Set! 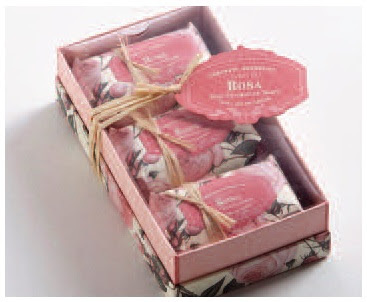 I liked the Fruits and Flowers Massage Soap in Tin - Cherry Blossom with sugar exfoliant. Everything looks amazing. I love the rose and tropical scents the best though. The sand dollar candle looks absolutely divine! Thank you for providing this giveaway. The soaps gift set in Orange would be lovely. The reed diffusers are beautiful,too. I like the Fig & Pear Candle. I'd love to try the Mango Lime Sugar Scrub! I love the Castelbel Candles - Lavender! I visited The Stratford Apothecary and I'm interested in the Tropical Fruits Massage Soap in Tin -Olive Oil with Olive Leaf exfoliant. I liked The Stratford Apothecary on Facebook. I followed @coupons4moms on twitter. I like the fruit and flowers soap in the tin, cherry blossom with sugar exfoliant. The coconut or fig & pear candle sounds really good! The Floral Vine Plum Flower diffuser interests me. 1.I follow you on GFC as sweetsue. 2.I follow you on GFC as sweetsue. 3.I follow you on GFC as sweetsue. I would like to try the Magnolia Hand & Face soap. my favorite product is the rose pedal lotion! TY for a great giveaway! Christina - xristya@rock.com - I love the Stargazer Lily and Rose soaps! I like the Naturally European Collection Massage Soap in a Tin: Vanilla - that sells for $8.97! The Isadermix Moisture-Rich Body Polish looks pretty great! I voted for you on picket fence blog! I like the Tropical Fruits Sugar Scrub and Puff Set - Passionfruit and Nectarine. The Castelbel Candles in Coconut interest me most to take me to the beach in my own apartment! I would love to try the soap in Black Fig and Pomegranate! The face and body soap in Honeysuckle sounds amazing. I would like the Homemade Facial Mask - Cucumber, Apple & Rice Bran. I like the lavender soap, but I also like the Castelbel Candles, especially in lavender.